I was thinking yesterday about the day they announced that the Seals had executed bin Laden - my reaction was one of positivity - not joy, not happiness, more like satisfaction that justice had been served. You can disagree, but you aren't inline with God or the scriptures on the matter. God loved and saved us even as sinners, and he rejoices when anyone returns to him. Similarly, he is saddened when people are lost. If you feel nothing for the loss of God's children, your heart isn't in the right place. Indeed, we have all sinned and fallen short of the glory of God. We all known temptation and sin, and we have all gotten the short end of the stick and been put in less than desirable circumstances. Thus we may generally empathize and have compassion and understanding for all people. This was one of the important reasons that Jesus needed to be a man - so that he could experience and understand the temptations that are common to man that he might better understand and empathize with us. No. And they should get what they deserve from the Law of men. But if after committing the offense they are truly sorry and feel terrible for what they did. And it comes from the bottom of their hearts. It's not an option of us Christians. We have to forgive them for their moral offenses. Reason not only because it's a command from Jesus. But most importantly because we to are not exempt for committing such offenses sometime in our life's. If you don't forgive a repented heart you are guilty of self-righteous. do you have different degrees of empathy and compassion for Hitler and his victims? Wow, the "Hitler" thing again. So, Hitler, murdering despot dies unrepentant and goes to eternal hell under your belief, right? Aunt Gladys, an agnostic who's biggest crime is an unpaid parking ticket also dies unrepentant and ends up in eternal hell as well, right? On the other hand, supposing Hitler had a last minute conversion before physical death and sincerely repented? Not awaiting eternal hell anymore, right? God knows the future. We do not. We cannot know if, in the future, such a person truly repented in such a way that God Himself forgives them. This is dangerous territory. Yes, We can punish them for their crime, that is okay. But beware of anything further, for our finite minds trapped in this timeline do not know the future that God knows. ......supposing Hitler had a last minute conversion before physical death and sincerely repented? Not awaiting eternal hell anymore, right? That is right. Extremely unlikely though, but possible. God alone knows if a repentance is real or not, and if Hitler really did repent in such a way that God forgave him, then Hitler is in heaven. And guess what, since the saints in heaven are perfected and cleansed of all bad natures, it will not bother them at all. hey will rejoice in the repentance. Now, I am glad to bet real money that he did not. I think it's definitely easier for us to emphasize and have deeper compassion for the innocent who suffered at the hands of hateful men than to emphasize and have compassion for the ones that inflicted said harm. Both good verses. If you are attempting to show a conflict, however, there is none to be found. God doesn't desire the destruction of anyone, but that doesn't mean he won't do it. He has given us freewill that we might choose for ourselves through our deeds. Those who persist in doing good are rewarded with life, those who persist in doing evil are rewarded with death. Deuteronomy 30:11-20 Now what I am commanding you today is not too difficult for you or beyond your reach. 12 It is not up in heaven, so that you have to ask, “Who will ascend into heaven to get it and proclaim it to us so we may obey it?” 13 Nor is it beyond the sea, so that you have to ask, “Who will cross the sea to get it and proclaim it to us so we may obey it?” 14 No, the word is very near you; it is in your mouth and in your heart so you may obey it. Right, in the meantime any of the victims of such despots who have been murdered and haven't repented are on their way to the same "hell" as the perpetrator. In context of that the OP is a joke. Listening to a Jordan Peterson/Joe Rogan youtube and Peterson is discussing a book I have heard about before and mean to read - has anybody read this? 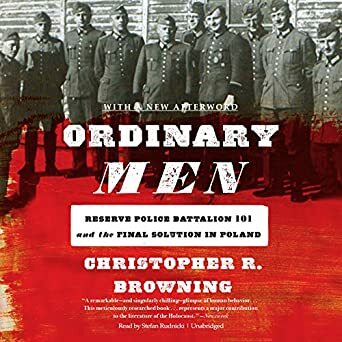 "Helps us understand, better than we did before, not only what they did to make the Holocaust happen but also how they were transformed psychologically from the ordinary men of [the] title into active participants in the most monstrous crime in human history."" -- New York Times Book Review""A staggering and important book, a book that manages without polemic to communicate at least an intimation of the unthinkable." -- Michael Dorris, " Chicago Tribune""A remarkable--and singularly chilling--glimpse of human behavior...This meticulously researched book...represents a major contribution to the literature of the Holocaust." -- Andrew Nagorski, "Newsweek"
Well... I don’t prefer the term or concept of original sin from the Augustinian perspective, because Uncle Augies was not very good at expressing what it actually is. It’s really to be understood in the sense of negation, as in “Lack of original righteousness”. Sin isn’t a “something”, it’s something missing. So sin is a something like a hole is a something. So most confuse “Original Sin” as a weird kind of “something”, and that it was this thing that was added to man like some intangible tumor on his nature. What I’m saying is that the missingness and lack in the unredeemed is not something that ever be filled after physical death while in their spiritual death. Thanatos (death) as a lack of communion means all that is necessary to fill that void that is sin is not available to them. Christ is the only means of administering this, and that’s done by being hypostatically joined to Him in this physical life. That is ridiculous. Your response assumes that people don't repent until they know the end is near in order to save their butts. If that is your plan, then you are already doomed. That is a sin in and of itself.